Dozens of individual farmers and ranchers, as well as local agricultural businesses willingly commit themselves to take part on alternate years. Liz Lauck, this year’s chairman, coordinated 10 “stations” with each business responsible for a display and demonstration that connects their livelihood directly to agriculture. Hatten’s Top Hat Arena generously offered their facility as the staging ground on Oct. 2 for this year’s LPCW Ag Expo. Buses came loaded with students from Chugwater, Glendo and Wheatland. 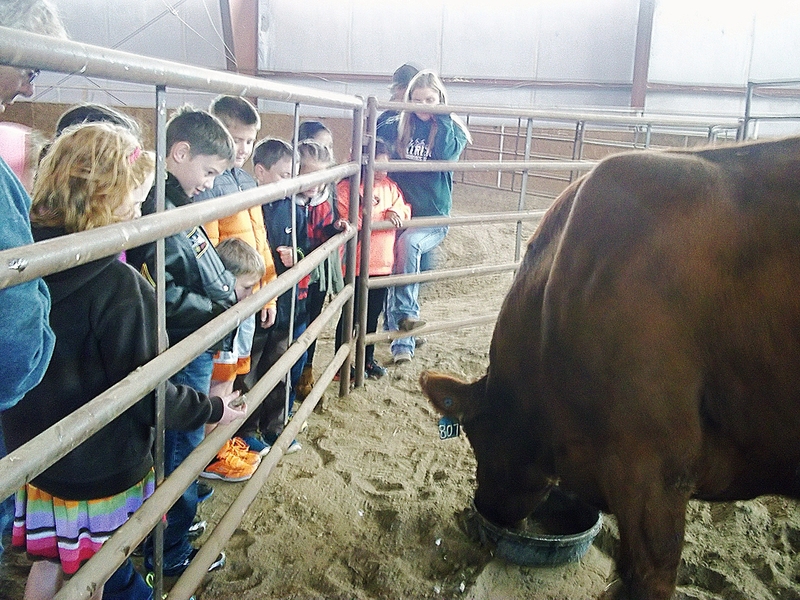 A number of homeschoolers also took advantage of this learning experience. 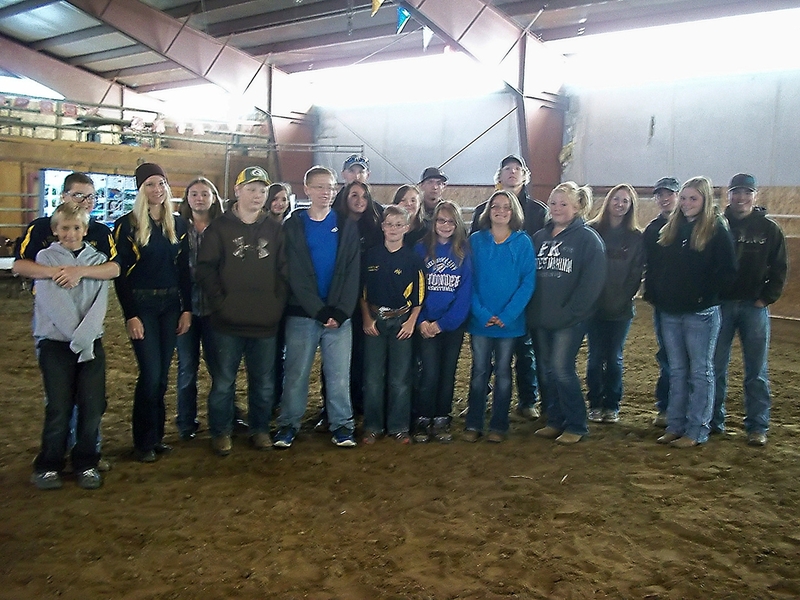 Glendo’s entire FFA Chapter, as well as several from Wheatland FFA, volunteered their services to act as guides for each break-off group as they circled to each station. The Wyoming Game & Fish display of animals pelts native to Wyoming was very popular. Stroking a wolf hide and seeing its actual size isn’t something most kids get to do. Dr. Dan Harnish came from Harnish Veterinary Services with a presentation on large animal health practices. The Platte County Resource District gave lessons on tree rings and how to determine the age of the trees and in what kind of conditions the tree grew. A gentle cow, provided by Sherri Cullen, was content to show off her calf as a trade-off for being hand fed by the students. Hatten’s penned a standard-sized horse along with a pony for comparison. A donkey was generous with his braying to greet the kids as Cynthia Pedersen discussed the equine species. Austin Pedersen brought several of his well-behaved chickens to be introduced to the students. 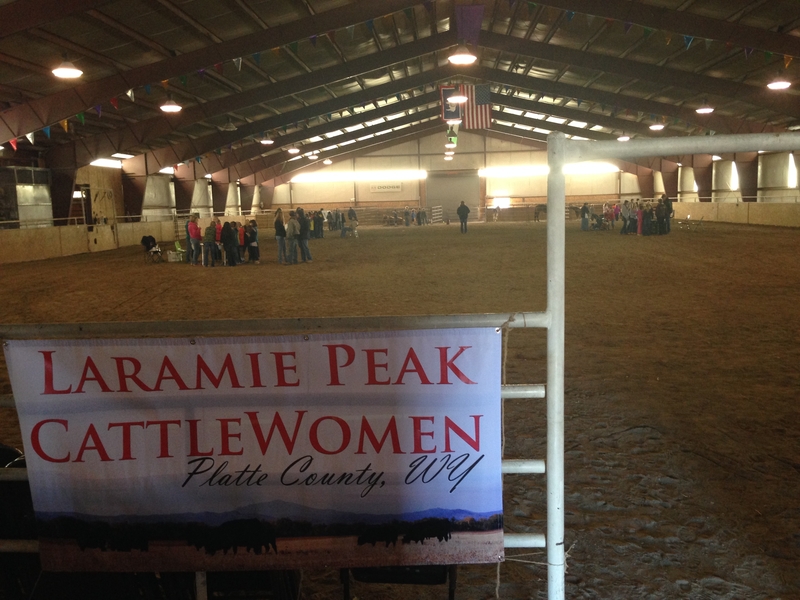 Sherri Cullen talks about cattle production at the 2014 Laramie Peak CattleWomen Ag Expo. 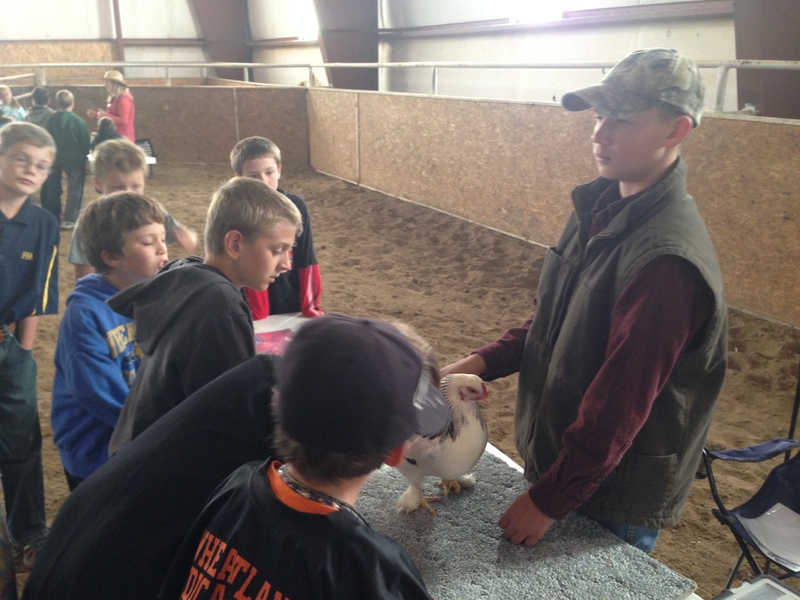 Austin Pedersen teaches students about chickens at the 2014 Laramie Peak CattleWomen Ag Expo. Huey Nickle parked an empty cattle transport trailer for all to explore the interior. 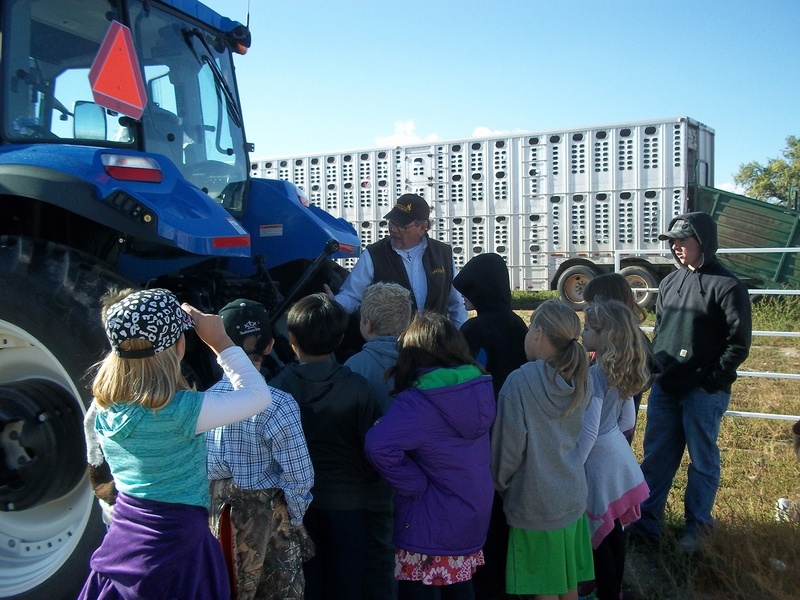 A tractor, provided by Brown Co., was available for inspection as Derek Barton answered questions and emphasized farm safety. Brown Co.’s Derek Barton talks about the role of tractors on farms and ranches and the importance of farm safety at the 2014 Laramie Peak CattleWomen Ag Expo. LPCW members, Lindy Schroeder, Jan Hyche and Judy West, represented the BEEF industry in explaining the stages of cattle production and the wide variety of products, besides food, that beef supplies to the American public. 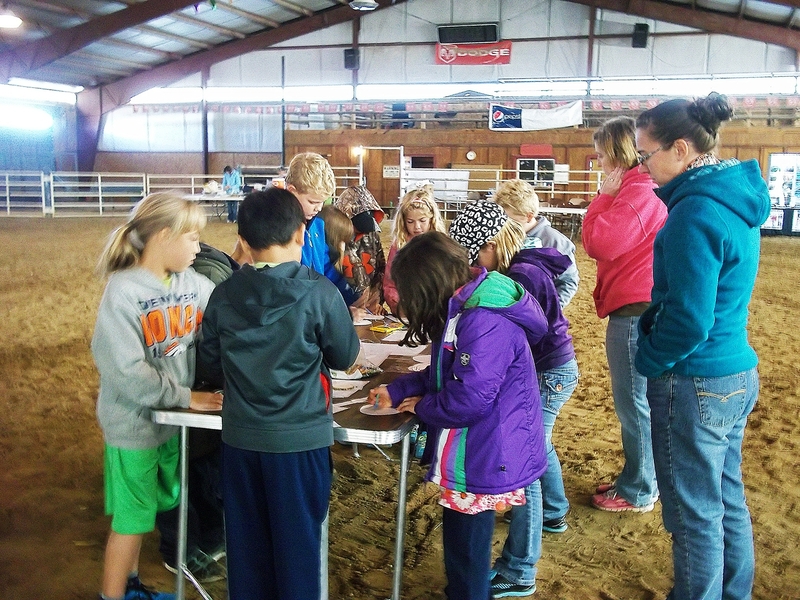 As the students viewed the various stations, Brook Brockman, Program Coordinator for the Wyo. Department of Agriculture, offered an educational opportunity for their teachers. A wide variety of helpful materials were displayed and available for use in the classroom. During the noon break, following a delicious beef lunch provided by Cindy Schanaman and Jeri Currier, The Platte County Resource District and Natural Resources Conservation Service demonstrated its rainfall simulator. Using several different samples of soil, the device simulates how soil structure, tillage practices and other factors affect precipitation runoff. As students returned to the buses, they were each given a packet of surprises for home use. Hopefully, memories of their day and what they learned will stay with them in the future.